Join the Women’s Hemispheric Network as we host our third conference in Mexico City. Conference participants will have the opportunity to network and join in the conversation with table leaders. This year’s conference will focus on building a better pipeline for female leaders in male-dominated industries and the importance of making bold decisions. Registration and Cancellation: Please contact Juan Serrano-Badrena at jserrano@counciloftheamericas.org before 12:00 p.m. on Monday, November 27. 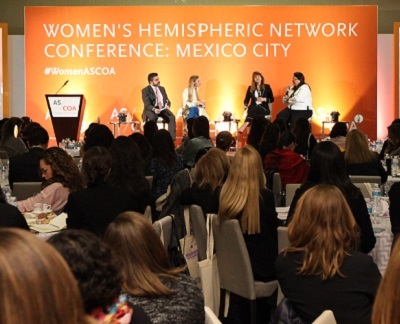 Join AS/COA's Women’s Hemispheric Network as we celebrate our third conference in Mexico City on November 29. Registration: 8:30 a.m. to 9:30 a.m.
Conference: 9:30 a.m. to 2:00 p.m.
All times are in local Mexico City time (UTC -5), one hour behind New York. Leaders discuss the importance of supporting women in traditionally male-dominated industries from the start of their careers to their success in the C-suite and boardroom. How do we get young women excited to study and work in STEM and other traditionally male-dominated fields? How can professional be best supported so they persevere in challenging or unwelcoming industries? Maria Elena Blanco, Apple, Inc.
Women from across the region share their experiences of taking chances, thinking outside the box, and building their careers. As a successful professional woman, how do you speak up so people listen? What advice would you give to young professionals seeking to become daring leaders? Maria Teresa Arnal is country manager at Google Mexico. Previously, she led Twitter’s operations in Argentina, Colombia, and Mexico. Arnal was also part of the team that founded the Interactive Advertising Bureau in Mexico and was president of the board of the World Internet Project in Mexico. She was also director in J. Walter Thompson Mexico, Mirum and Clarus, a company that she founded. Arnal holds an M.B.A. from Columbia Business School and is an industrial engineer from the Andres Bello Catholic University in Venezuela. Alberto Chaia is senior partner of McKinsey & Company, Mexico. Previously, he served in the Ministry of Finance for Mexico as the program leader for establishing rural banks from 1995 to 1997. Since joining McKinsey in 2002, Chaia has led economic development and financial inclusion projects in the Americas, EMEA, and Asia. Before this, he was visiting researcher for the Bank of Mexico. Laura Chinchilla Miranda is the former president of Costa Rica (2010-2014) and the first woman to be elected President of her country. Previously, she served as the first vice president and minister of justice in the administration of Óscar Arias Sánchez from 2006 to 2010. Ms. Chinchilla has dedicated her career to public service and to consulting in Latin America and Africa for international organizations such as the U.S. Agency for International Development (USAID), the Inter-American Development Bank (IDB), and the United Nations Program for Development (UNDP). Jonathan Ruiz is the chief of digital and printed business and economy content at El Financiero. He is also the editor of Bloomberg Businessweek Mexico magazine and appears daily on the TV program Mesa Central on El Financiero Bloomberg. Ruiz has been a journalist since 1999 and has previously been a reporter and editor at Grupo Reforma and Grupo Milenio. Evelyn Vilchez has been the general manager of Chevron Energía de México since March 2017. In this role, she promotes Chevron’s key stakeholder relationships in Mexico to help advance the country’s hydrocarbon sector and Chevron’s interests there. With more than 30 years of experience in the oil and gas industry, Vilchez has held commercial, business development, and strategic planning management positions with Chevron in Venezuela, Angola, and United States. Veronica Zavala Lombardi is the Mexico country representative at the Inter-American Development Bank (IDB). Previously, she worked as a sector manager for the World Bank and was exited director for Colombia and Peru at the IDB. Lombardi was minister of Transport and Communications of Peru from 2008 to 2010. She also served as director of public management for the President’s ministerial cabinet from 2005 to 2006. She holds a degree in Law from Pontificia Universidad Catolica del Peru and an M.P.A. in public administration from Harvard University. La ex-Presidenta de Costa Rica Laura Chinchilla dió clausura a la tercera conferencia de la Red Hemisférica de Mujeres de AS/COA en la Ciudad de México. La primera presidenta de Costa Rica habló de su legado como líder y los desafíos que tuvo que enfrentar como mujer, destacando también las habilidades femeninas que van desapercibidas. "Luchar es el sinómino de mujer. Las mujeres se caen, tropiezan, son atropelladas, castigadas, pero siempre se levantan", dijo Chinchilla. Aprenda más sobre nuestra red de mujeres. #womenASCOA video: Panel sobre decisiones valientes - ¿Cuándo vale la pena tomar el riesgo? ¿Cuál es la decisión más valiente que has tenido que tomar como mujer profesional? Eso le preguntó Jonathan Ruiz a líderes femeninas en el segunda panel de la conferencia de la Red Hemisférica de Mujeres de AS/COA. Las mujeres compartieron historias personales sobre los desafíos que enfrentaron a lo largo de sus carreras. Aunque las mujeres son un 50 por ciento de los graduados universitarios en México, solo ocupan un 20 por ciento do los puestos ejecutivos en las empresas privadas. Un panel de profesionales femeninas compartieron sus ideas en la conferencia de la Red Hemisférica de Mujeres de AS/COA en la Ciudad de México.